The minister of social development Susan Shabangu stuttered over the pronunciation of LGBTQI. â€œTeach me,â€she said. The minister was addressing a crowd of gender activists, delegates and government officials at the National Gender Summit that took place on November 1 and 2. 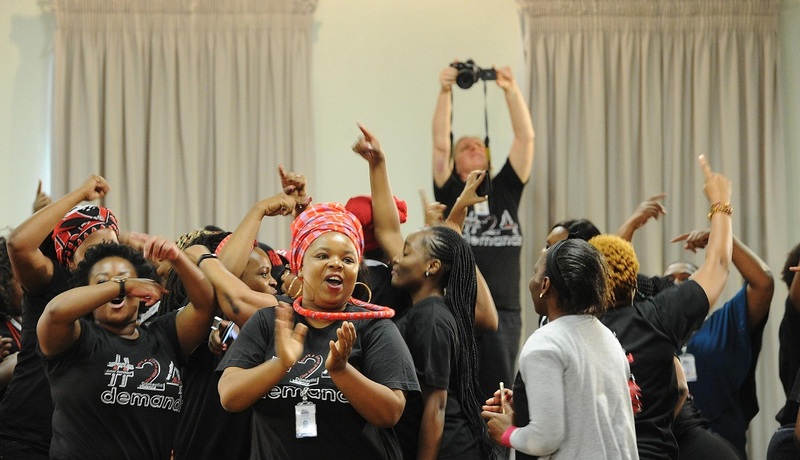 The Summit was held after the intersectional womxns movement The Total Shutdown demanded that government seek solutions to the pandemic of gender-based violence (GBV) and femicide that plagues womxn* in the country. If our leaders cannot even get acronyms right, it is doubtful that they are sincere in their attempts to address the issues we face. â€œThe whole process was very productive,â€ TTS spokesperson Loyiso Saliso said. â€œWe will really celebrate when we see implementation. As TTS and womxn of this country, we need to be the machinery that monitors the government,â€ she said. While the Gender Summit was a win for the mass mobilisation of South African womxn who marched on August 1 under TTS banner, there were issues with which show that we have a long way to in the eradication of GBV and femicide. It is important to question the motives of the African National Congress (ANC)-led government holding the Summit so close to the 2019 national elections. We have to ask whether this Summit would have been so easily organised had TTS called for it last year. The speaker of national assembly Baleka Mbete used her speech on the first day of the Summit to campaign for the 2019 elections. And she was not subtle in her politicking. Mbete made constant reference to the wonderful policies that the ANC has in place saying that all we needed was better implementation. Not to mention, Mbete stumbled on the name â€˜The Total Shutdownâ€™ and called it â€˜Hashtag The Shutdownâ€™ to the frustration of TTS members and delegates alike. The special advisor to the president Olive Shisana couldnâ€™t get the name right either. Mbeteâ€™s speech was a direct contrast to the speech given by President Cyril Ramaphosa who followed. We have to give credit to the person who wrote his speech where he said â€œThe murder of womxn* in this country is corroding the soul of our nation.â€ He lamented the prevalence of GBV in the country and said we cannot decrease it, we need to eradicate it once and for all. But whether this means he is a good politician or that he is serious in his attempt to address the problem remains to be seen. What was uncomfortable on the first day of the Summit was the session where survivors of GBV shared their experiences of sexual violence. This session was carried out without warning despite that it was likely to trigger other survivors. While it is important for womxn to share their experiences of GBV, this might not have been the correct platform. There was no purpose because everyone in the room understood the scale of the problem of GBV in South Africa. Whatâ€™s more, it felt voyeuristic. Here we were as delegates and media, watching these womxn lay their pain bare in a room full of hundreds with recorders turned on and cameras flashing. One of the womxn had her scars publicly shared when a delegate posted her picture on social media for all to see. Not only was the survivors picture shared without her permission, according to the TTS it went through Whatsapp groups where she was re-victimised through with crude and damaging comments. This incident showed that despite governmentâ€™s attempts to make the issue of GBV seem like it is only a policy implementation problem, there are deep-set mindsets and behaviours that need to be addressed and changed. Exclusion from the space was a pertinent talking point during the Summit. A group of womxn from the Gauteng Community Health Forum and Sibunye Women Forum held a picket outside the main hall where Ramaphosa was going to address delegates. Speaking to The Daily Vox, the womxn said the Summit should not have happened as it excluded womxn from the rural areas and townships. Taking place in an elite hotel in Centurion far from most public transport routes meant getting to the Summit would have been difficult. The language of the summit was also exclusionary to many as it was conducted in English. Two of the survivors – while relying their stories – made the point that English was not their first language, yet they had to speak it. Answering a question from The Daily Vox, Saliso said the movement respects the fight of the womxn to protest outside, and that they wished they could have been inside. â€œThose womxn are a part of us. Us being here – we donâ€™t just represent people that are here. If we can get all womxn from across the country to be here, we would do that. The womxn that are here are representing the womxn who could not be here including the womxn that were outside,â€ Saliso said. Moving forward, one of the declarations from the Summit – which have not been signed by all delegates – had resolved that delegates should work together to set up a National Strategic Plan on GBV and femicide within the next six months. Government took a considerable amount of time to set up the summit, and many of the deadlines from the 24 demands have passed as well. Even with the amount of support and voice the TTS has, the real challenge remains in whether government will fulfil the promises theyâ€™ve made or whether the national issue of GBV will be swept under the carpet once the 2019 National Elections have taken place.